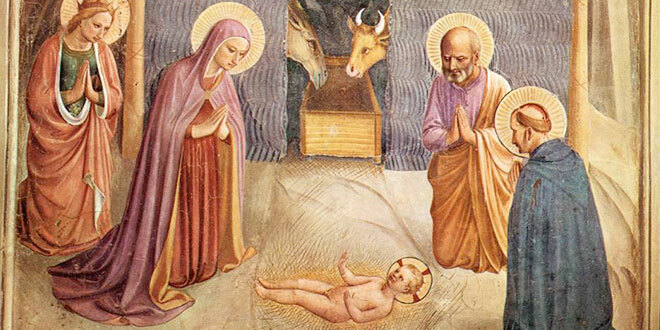 Saviour of the world: The Nativity, by Fra Angelico. AS we once again gather alongside the Magi to adore the Christ-child, to hear the message of the angel with the shepherds in the field and to praise God in song together with the heavenly host, we cannot help but marvel at the wonder of the Incarnation. The simple fact that, just 2000 years ago, God condescended to be born among us – as one of us – is breathtaking. That He spent his first hours upon this earth wrapped in bands of cloth and was placed by the Blessed Virgin in a feeding-trough – He who was the bread come down from heaven, He whose Body we consume in the Eucharist – should never cease to astound us, nor cease to fill us with joy. Yet this is a mystery so profound that many people over the centuries have failed to grasp its significance or even credit it with belief. Indeed, the establishment of the Order of Preachers – which, on the twenty-second of this month celebrated the 800th anniversary of the papal bull which first confirmed and approved St Dominic’s vision of the order – was prompted in no small way by St Dominic’s experience of a group of people in the south of France who neither understood nor believed in the Incarnation. The Cathars – or “Albigensians” – of Languedoc and the surrounding regions refused to believe that the omnipotent Creator of the universe could actually have taken on human flesh and become man. The Cathars would not give credence to the idea that God is indeed so great that he willingly became small; that He took on the form of a servant for our sake. They preferred to think that God only seemed to be a man, only appeared to suffer and die on the cross. Ultimately, they believed that divinity, sanctity and spirituality were totally divorced from the material world. They believed that all material creation was bad, the work of an evil “god” who worked in opposition to a good “god”. Our soul, the creation of the good “god”, was trapped inside our material bodies which had been created by the evil “god”. As a direct consequence of the Cathar’s belief that all material creation was inherently evil, it was impossible for them to accept that Jesus Christ really did become incarnate – “en-fleshed”, as it were. Yet this is precisely what Christmas celebrates and that is exactly what St Dominic and the first Dominicans were to highlight in their preaching – that the material world is good, created by God, and that the Incarnation – God’s becoming man – is an essential tenet of Christian faith with a profound consequence – the Incarnation restored meaning to the world. Our lives have significance, purpose and consequence precisely because Jesus Christ – God Incarnate – was born as one of us, lived as one of us, died as one of us and rose again as one of us. In Jesus Christ, not only does the deepest truth about God shine forth, but salvation is restored for us because he was one of us. As put most succinctly by Yves Cardinal Congar, “our own resurrection, the supreme article of Christian faith and hope is assured only if the resurrection of Christ is real, only if God really became man”. Nothing of our humanity has been saved except that which was assumed by the Son of God in His Incarnation. It is essential that we understand that this is the reason why the Feast of the Nativity of Our Lord in the Flesh, as Christmas is called in the Orthodox Church, is such an occasion for rejoicing. Christmas is inherently united with our own redemption, and our excess of feasting, gift-giving and party-hat-wearing is an eloquent witness to this fact. Some of us might be underwhelmed by the quality of jokes found in the Christmas-cracker: yet none of us can help being overwhelmed by the birth of Jesus Christ. All of us ought to feel a jubilant flutter of the heart when we recall how intimately our own salvation is connected to the birth of the Christ-child in the manger. Our celebration of Christmas is our opportunity to revel in the “good news of great joy” (Luke 2:10) preached by the angel to the shepherds in the fields of Judea: “to you is born this day, in the city of David, a Saviour”. His name is Jesus: a name which means, “God Saves”. Br Sebastian Condon is from Brisbane. He is undertaking a novitiate with the Dominican order in Hong Kong.